This coloured frame wheelchair with attendant brakes comes with all the features you'd expect from a high quality transit wheelchair. The adjustable footrests swing away, making getting in and out easier, solid puncture-proof front and rear wheels, heel loops, and a backrest that folds down. There is also a seat belt for added safety. 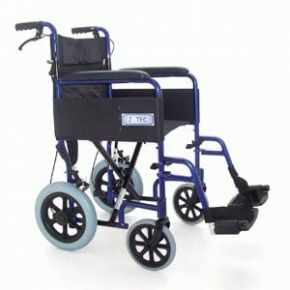 The attendant controls the brakes through a simple, effective handle-mounted system and the wheelchair is light in weight at about 10kg or 22lb. It suits users up to 116kg or about 18 stone. It's a good chair at a great price.